Have you ever been playing Portal and wondered how The Doctor would do in Aperture Science? Thanks to Warner Bros. Interactive Entertainment now you can find out. 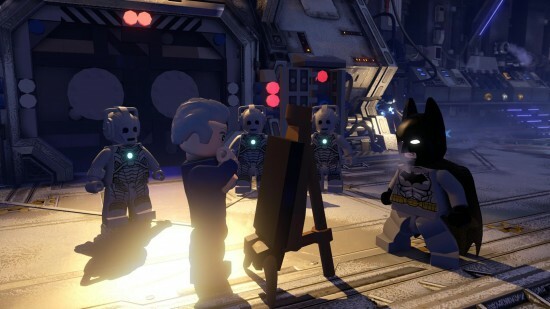 LEGO Dimensions announced at San Diego Comic-Con the upcoming inclusion of Doctor Who. It is the first time Doctor Who has ever been in a LEGO videogame. The stars of the BBC America show have lent their voices to their respective characters in the game as well. Peter Capaldi, Jenna Coleman, and Michelle Gomez have all brought their Doctor Who personas to LEGO life in Dimensions. The game is truly a mash-up of worlds. The TARDIS could pop up in Gotham City or The Doctor could ride along with Scooby and Shaggy. As is seen in the trailer, all twelve doctors are included in Dimensions. In fact, LEGO has pulled out all the stops to please Whovians. When the Twelfth Doctor is defeated in a level, he returns as the First Doctor and then continues regenerating back up to Twelve. The TARDIS interior changes depending on which Doctor is “alive” but can also be manually chosen by the player. A jukebox inside the TARDIS allows players to select different versions of the Doctor Who theme music. Yesterday, a video surfaced on a random YouTube page titled REVEAL PLAYSTATION 4 PS4 E3 2013 新しいプレイステーションE3プレゼ. Since most people over here in the US don’t read Japanese, they just assumed this as a mark of authenticity and speculation began running wild. Although later disproven when Sony, the king of “no comment”, actually remarked to Kotaku that the ad was a fake, the damage had been done and arguments had already began, friendships were ended and wars were started. But why the debate? We have already seen what is arguably the most important aspect of the PlayStation 4 with the reveal and that was the gameplay. The only thing of significance “revealed” for the first time was the actual PS4 console. Does what the box itself looks like really matter? I don’t know about you but the box itself isn’t the visible focal point of my entertainment setup. While everything is either going into the XBox 360 or PlayStation 3, I never actually care to look at it as I am playing. Sony announced yesterday that with the purchase of a 12 month PlayStation Plus subscription, buyers would also get an additional 3 months for free added to their subscription time. A 25% bonus is nothing to ever be disappointed in. 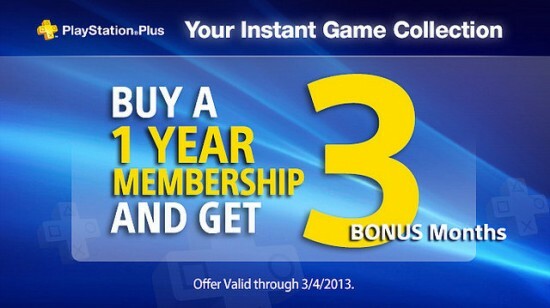 But the question comes up if PlayStation Plus is worth the $50 yearly (now technically 15 month) price point. When asked about the launch of the PlayStation 4 by UK publication The Times, President and CEO of Sony Corporation Kaz Hirai gave that as his response. This can lead us to believe that the PlayStation 4’s official announcement and possibly release as well will follow those of the upcoming next XBox console. While last week there were leaks indicating that the PlayStation 4 may launch before the next XBox including predictions from Robert W Baird analyst Colin Sebastian, this statement from Kaz seemingly contradicts it. But there is a problem with this statement that you might miss at first glance. Way back in 2011, The Flickcast was covering Anarchy Reigns from SEGA and Platinum games pretty heavily but at the start of 2012 news about the game started creeping to a standstill. Though it was released in July of this year in Japan, there was a placeholder March 2013 release date for the game. Now, SEGA has confirmed that Anarchy Reigns will be coming to the states on January 4th, 2013. With that, they also confirmed that Anarchy Reigns will be coming to both the XBox 360 and PlayStation 3 with the value minded price point of $29.99. For those that haven’t been following it, Anarchy Reigns is an online multiplayer focused beat ’em up which features some of the cast of the Nintendo Wii’s MadWorld as well as some new characters as well. You can find some of the vignettes for the characters we have highlighted on the Flickcast here. 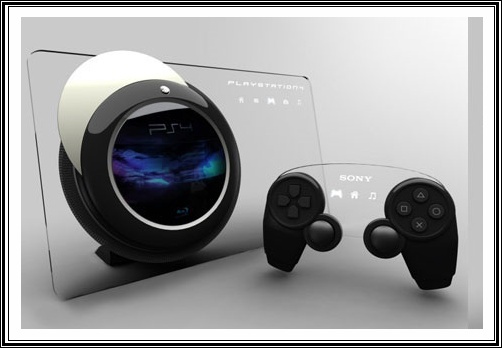 While the gaming world somewhat anxiously awaits the release of the successor to the PS3 (aka the cleverly named PS4), Sony has something over there in its right hand to distract you. What is this something you may wonder? Why, it’s a brand new version of the PS3 of course. That’s right, today the company announced the CECH-4000 model. It will be 20% smaller and 25% lighter than the previous model and will also ditch the slot-loading optical drive in favor of a disc-tray that slides open sideways. 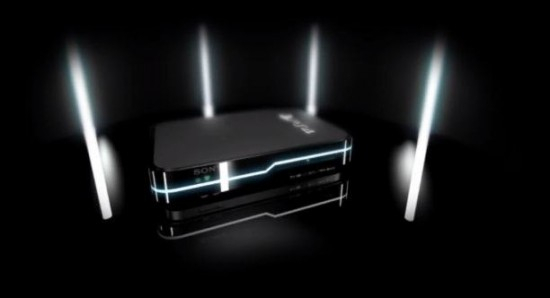 The new PS3 will come in two versions: a 250GB that will sell for $269.99 and a 500GB that will sell for $299.99. The 250GB model, which launches on September 25th, will be sold in a bundle with the game Uncharted 3: Drake’s Deception and will also come with a $30 voucher for digital content for the game DUST 514. Interested in the 500GB version? You’ll have to wait until October 30th for that one when it comes out as a bundle with Assassin’s Creed III. So, anyone interested in a smaller, lighter, tray-loading PS3 or are you just gonna wait for the PS4, which is expected sometime next year? Supposedly. Naughty Dog is one of those developers that is just on a serious roll. Since they began making games for the original Playstation, all they have done is create three of the most popular franchises in Sony’s video gaming history. From Crash Bandicoot, to Jak and Daxter, all the way to Uncharted, Naughty Dog has been on the cutting edge of gaming. What they were able to achieve in the Uncharted series was utilize the power of the Playstation 3 to tell a video game story in an incredibly cinematic way. The end result was an experience that some how feels like watching a movie, reading a novel and playing a video game all at once. Now Naughty Dog is moving forward with another new IP for the Playstaion with The Last of Us, a post-apocalyptic action adventure game. We have seen a trailer for this game already, and it clearly demands out attention, but to cap off their 2012 E3 Conference Sony showed off seven minutes of game play to wet our whistles. The footage showcases the visual beauty of this run down world, and the shocking realism of the battles. If Naughty Dog can continue to push the envelope of storytelling in a video game package, The Last of Us looks to be one of the most impressive releases of the year. Check out the full seven minutes of game play after the jump. We recently showed you the brilliant short/tech demo Kara by innovative game studio Quanic Dream. It showcased the amazing technical capabilities of the PS3 and the story telling prowess of developer to amazing effect, all that was left was for Sony to announce what new game they were actually working on. Leading off their 2012 E3 Conference, Sony announced that Quantic Dream has been working on an all new IP, Beyond: Two Souls. This game uses incredible character based graphics to tell the tale of Jodi Holmes who seems to be able to communicate with a powerful entity. The developers were very quick to point out that they went out of their way to cast a top quality actress to be the lead in the game, Ellen Page. This emphasis on character and acting is a move that we are going to come to expect from Quantic Dream who already put out a character over game-play game, Heavy Rain. At the Sony conference a debut trailer was showcased, that really shows off the character animation. The meat of the trailer is a scene from early in the game where Jodi is being interrogated by a small town sheriff. We then get some impressive, but quick glimpses of the action in the game. Check out the full debut trailer after the jump. We have an epidemic people. In the past few weeks BioShock: Infinite and Tomb Raider both were officially confirmed pushed to early 2013. One or two delays make sense, and at the end of the day wont really have a big impact on the season, but we now have two more to add to the list. Last week THQ announced that Obsidian’s South Park: The Game would also be pushed to the early portion of 2013. This ambitious RPG might not have yet been on a lot of people’s radar, but the game has been written by Trey Parker and Matt Stone with Obsidian getting a lot of support from the folks at South Park Studios. So it is likely the game will be a big deal once it gets close to release. Our vision has been to create a video game sequel to the original Alien trilogy. Our vision is for the game to be fully featured with an exciting, suspenseful, thrilling and action packed narrative campaign that can be played alone or cooperatively combined with a robust competitive game where human players can take on the roles of Colonial Marines or Xenomorphs and do battle online. The game must be authentic. Hopefully the later release date will help Gearbox properly follow through on those visions. Alien: Colonial Marines isn’t just getting a nebulous delay though, an official release date of February 12th has also been announced. These two new delays have started to make early 2013 seem a little crowded. The normally lack luster post holiday gaming season might just be pretty worthwhile next year. Remember a few months ago when it seemed like fall 2012 was loaded with tons of awesome, highly anticipated video game releases? Our priority now is to make sure we fully deliver the very highest quality game. In order to do this, we have decided to move the game’s release date by a few months, from Fall 2012 to the first quarter of 2013. We’re doing things that are completely new to Tomb Raider in this game and the additional development time will allow us to put the finishing touches into the game and polish it to a level that you deserve. We believe this is the right choice and I guarantee it will be worth the wait. The game is looking amazing and we can’t wait to show it to everyone at E3 in a few weeks. Unfortunate news for a game that a lot of people were really look forward to. Although we here at The Flickcast think this might be for the best, in a world where Uncharted has set a new standard for action and treasure hunting games, Tomb Raider has a lot to live up to. At the very least the game wont be a no-show at E3 like BioShock, so we wont have to long to wait to see what sort of additions this delay allows.